Nearly complete Katakana character set. Midori means green in Japanese. Info: Created on 28th March 2011 . Last edited on 29th March 2011. Thank you for your comments and ratings. Unfortunately, I don't speak Japanese, but I could decipher your comments with the help of Google Translate. This fontstruction is a new adventure to unknown territory. I would really appreciate any critique regarding the proportions, vertical alignment and legibility of the glyphs. @CMunk: I've made some tests with Hiragana using the same dot size vs. glyph proportion. I should probably reduce the relative size of the dots to build the more tortuous letters. Yeah, the hiragana will probably be a bit of a challenge at the current proportions. I find it very legible. Though, Japanese is not my native language. I have tried some japanese fontstructing, and I am also a bit in doubt about the proportions and alignments. What you have done looks stylish and natural to me. Congratulations! FontStruct Staff have deemed your FontStruction worthy of special mention. “Midori Dot” is now a Top Pick. No, I don't speak Japanese either. I only speak English. Congrats. Lovely font, beautiful curves impeccably solved, a whole piece of art that causes me envy. This pushes me to study Japanese. @Xenophilius: Hiragana is one of the three writing systems the Japanese use. Frodo7's font uses Katakana, a system the japanese use mainly for foreign words and emphasis. The third writing system is the Kanji (or Chinese characters). A better translation would be "How about hiragana?". Oops! So many comments. A few of them in Japanese. It is hard not to think of Japan these days, as the news keep coming about Fukushima. @meek: Thank you for the special mention. 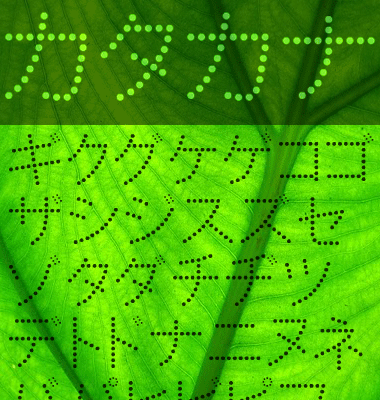 It was easy to use Fontstructor's Katakana support. @xenophilius: the filters are set to 2:2. That gives more freedom to position the dots on the grid. @elmoyenique: Thank you for your comment. Part of the challenge was to follow the subtle curves and angles not found in regular Latin characters. Good luck to your Japanese studies. @CMunk: I might add one important use of Katakana: the brand names and corporations (Toyota トヨタ, Kawasaki カワサキ). Christian Munk :Amazing 10point Hiragana is? @Mitumitu2017: Thank you for your comments. Midori Dot was created in March 2011 shortly after the Fukushima Daiichi nuclear disaster. At that time the tools of Fontstruct were much more limited for precisely positioning the dots. Naturally, I've done some tests for a possible Hiragana set, only to conclude it was not feasible at that time. The advent of the Nudge function in May 2014 and its subsequent refinement in 2016 have changed the situation considerably. Today's Fontstruct is very friendly with dot fonts: you can adjust the position of dots in small increments. Perhaps, it's time to make a new version with Hiragana added.